After the initial grass is laid, you may want to do minor repairs or replacement in smaller areas in the subsequent years. 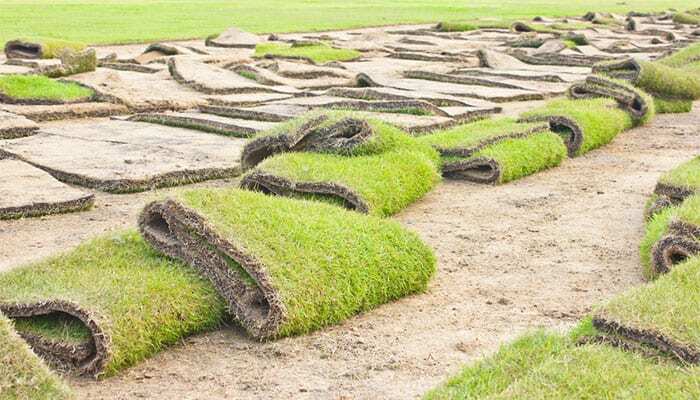 Don’t stress about it — here is how to repair, relocate, or replace turf correctly. You can also have professionals prepare and lay your turf for you. Finding patches of dead grass or bare soil within your lawn can be very annoying. How you repair the lawn depends of course on what the problem is. Here are a few things to check for. If you have a patch of dead lawn but the rest of the turf is fine, your sprinkler system may not be reaching that affected area. It may be as easy as fixing a sprinkler head. If you have many dead patches throughout the turf, you may have poor soil quality, Make sure you are using a high quality fertiliser and wetting agents. You can do a simple pH test for your soil and adjust from there as well. Soil pH should be between 6 and 7, with an ideal of 6.5. Over time, many lawns become compacted due to people or vehicles pushing down on them. You can aerate your soil with a coring machine, or do it by hand with a large garden fork. Fill the holes with fertiliser and a wetting agent. It will look rough for a little bit, but should self-repair after a couple of mows. If you have a patch of dead grass, you can either reseed it or move a segment from another section into it. You may also wish to relocate turf because you are starting a garden or other landscaping project. You will be moving turf onto a patch of bare soil. Make sure your soil is tilled, add compost and sand, and then have it tilled again, fertilised, and raked. Water the soil the day you will be moving the turf. Do this part with care, and learn more about preparing soil before you begin. Start by mowing the segment you are moving so that it is more manageable. Draw a line in the grass with landscape paint so that you end up cutting in straight edges. You’ll want to make a rectangle about half a meter wide or narrower, and the entire length of the segment. Using a sharp square shovel, make deep cuts in the turf by placing it directly on top of the line you marked and pressing down hard with your foot until you reach the bottom of the turf. Repeat all along the outline of the turf, slightly overlapping cuts so you don’t have any small straggling pieces. Repeat your rotation around the line, only this time put the shovel at an angle and pry the turf off the ground. Go all the way around until it is completely loose. Then, starting at one of the narrow ends, pick up the turf and roll it to the other end. Place the turf on your prepared bare soil. If you are using multiple rolls, stagger the edges rather than lining them up. Using a lawn roller with a water case (available for hire at most home ware stores), firmly go over the grass you have just laid. You’ll need to keep the turf damp by watering it every day for six weeks. This will allow the roots to integrate and mix with the existing turf. Try not to walk too much on the relocated turf, and mow it for the first time only when it exceed the recommended mow height by about one third. If you’re looking to repair or replace turf, we encourage you to get an instant quote. Visit our website now or call 1800 040 981. See our full contact details here.